"Great easy experience, I would highly recommend. Jeff is..."
For a FREE no-obligation estimate in Santee, SC, please fill out the form to the right and Carolina Energy Conservation will contact you shortly. The crew did an amazing job on my attic insulation. The foreman explained everything in detail and I knew exactly what they were doing as they went. They air sealed the attic and blew in cellulose insulation over top the old stuff. They cleaned up almost better than it was before they got there! I can already see the savings on my electric bill and my home is much more temperate. We specialize in a variety of services aimed to lessen your home's carbon footprint and save energy and money each month! We offer it all, from air sealing to ductwork to insulation and HVAC services in Santee, SC. For a FREE, no-obligation services estimate in Santee, SC, you'll also receive a free copy of "Saving Energy and Money at Home," a great book to use as you begin to create a more comfortable, healthy, and energy efficient home! Get The Most Out Of Going Solar! 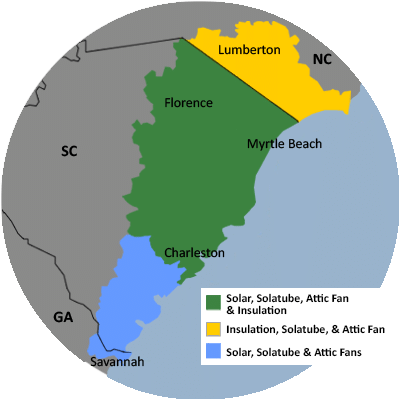 Santee Cooper Solar Rebate Partnership!